Do you see what’s new in my apartment bathroom? It’s hard to miss the renter friendly peel and stick tiles I added to my bathroom this past week. 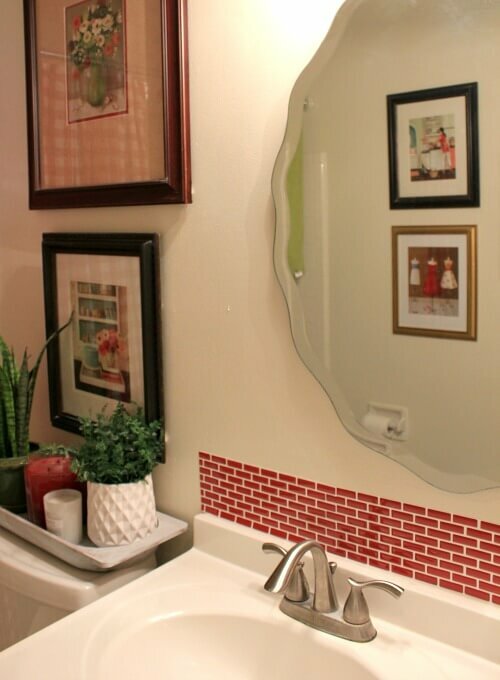 The red peel and stick tile sheets are from Wayfair. I paid $50 for ten sheets that are approximately 10×10 inches, and I didn’t even use half the order. But I knew I’d have to splice the “tiles” in, so I wanted more than enough to work with. I peeled the paper off and gently applied it to the wall, lining the new sheet up where the previous one ended. The reason I did this is because water gets splashed on the wall above the faucet. I figured this would give it a bit of protection. The black container in the corner of my vanity was made to hold silverware in mason jars. But I’m using it to hold bathroom necessities like soap, toothbrush and toothpaste. When I’m cleaning the top of the vanity I just lift up the whole container. I like things to be easy. Like I always say: Love it while you rent it. And wherever I live, I’m going to figure out ways to love my home. There are so many ideas out there to improve your rental home on a budget. Over a year ago I added the new vanity, mirror, faucet and lighting. Before I moved in four years ago I had a new taller toilet put in and a nice shower head installed. I paid the maintenance man here at the complex to do the work. I paid around $300 for the vanity, $50 for the faucet and I can’t recall what I paid for the lighting, all of which I ordered from Home Depot. I found the $20 mirror at the antique mall. I think those four items came in at about $600. I probably paid a few hundred for the toilet and shower head when I moved in. So a close estimate for all my bathroom changes including labor is around $1000. It is certainly worth it to me to be able to love my bathroom. Now I need to figure out what to do with the ugly tile floor that has seen better days. A few of the floor tiles were broken when the vanity was installed. And I know that’s going to be problematic in getting something to lay flat. Have you ever used peel and stick tiles before? I hadn’t, but it’s a nice alternative for renters. I love the red in your bathroom, especially the shower curtain. Red is such a happy color, my favorite. I like all of your changes to your apartment. I recently moved into a tiny house and I like looking at your posts about living in small places. Your uses of things you already have keeps me thinking about what I have that can be re-purposed for use everyday. 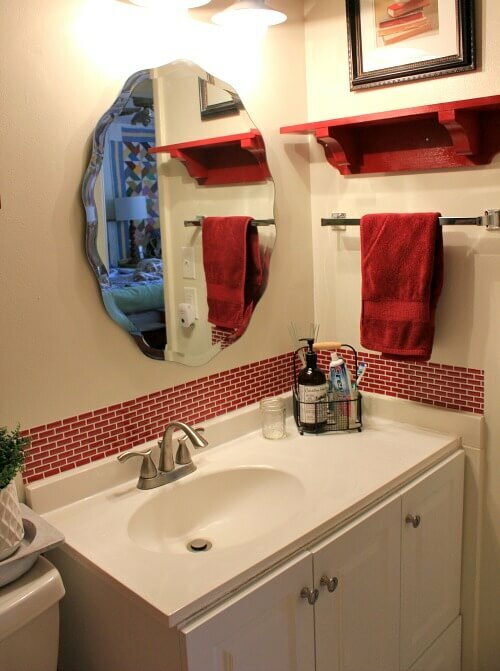 Love the red bathroom and your new tile on the backsplash. Have you thought of painting your floor. I this is in my old house. Just prime and paint! I had a very tiny bathroom floor that I painted the background white and then mod podge some of my favorite cards on the top. Then mod podge over the entire floor. I love t0 read all the cards from my favorite people every time I was in there. LOL You could also stencil a design and then paint a clear coat over it. I than placed a small red rug over the floor. I had a check red/white shower curtain too. I love everything about your bathroom – you did an outstanding job. It’s beautiful, Brenda. The red and white is so cheery. Thanks for sharing. What a pretty bathroom. I really do like that peel and stick tile and I love your shower curtain. And it looks like your vanity has quite a bit of storage. Gotta love that RED! Jumping on with some well deserved kudos for your pretty bathroom. If you don’t mind me asking where did you find the shower curtain? I love it!! Your lady case with the red lipstick would look cool in there too. Hey, you’re right about the lady vase! I got the curtains at Primitive Star Quilt shop, but I don’t think they carry it any more. I’ve had it about four years. You do a marvelous job with the color red to accent a room – looks great! I love the red in your bathroom. I love the shower curtain too. I think you are finding great ways to spice up your decor and still stay within guidelines of renting. Have a great week. 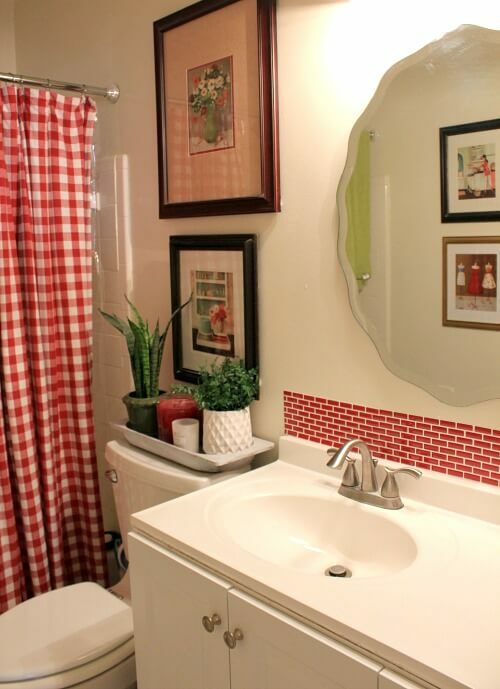 Love the tile, how fun is that and all the red is so pretty. I would suggest you paint the tiles and then stencil over the paint. If you would like to see some examples of flor stenciling, Cutting Edge stencils have a few on their website. I believe that look would fit in to your decorating scheme and be fairly inexpensive to do. If you have standard 12” or 6” tiles their stencils would line up perfectly. Love your bathroom – those new peel-and-stick tiles look fantastic! We’re not renters; we own our home, but now I’m thinking of maybe doing the peel-and-stick tiles in my bathroom anyway, simply because I think they look nice and we’re not very handy! I think I could handle peel-and-stick. 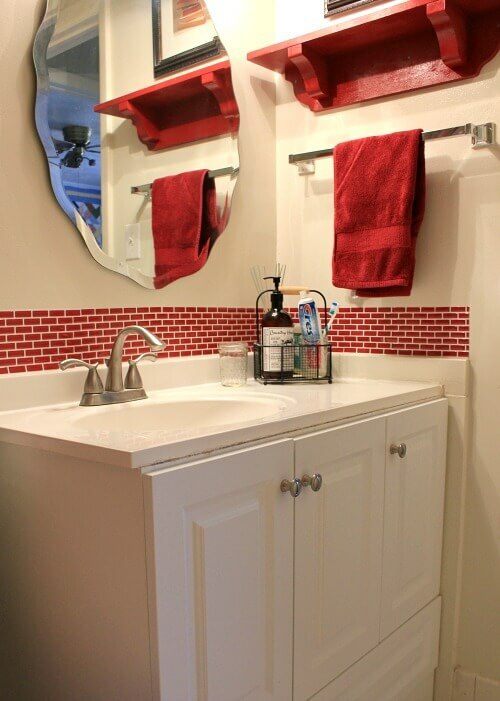 Red is my weakness and your bathroom is outstanding!! I love how personal you have made your rental bathroom! The back splash tiles are so cute! What a great idea! 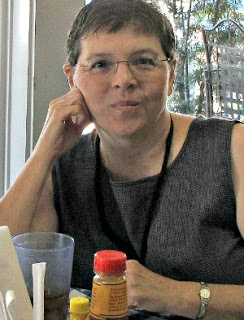 Adorable, Brenda!!!! Such a cute bathroom – and you’re right, you plan on staying there for a while, you may as well like what you’re looking at every day!!! So pretty! You always have such neat ideas and you do it on a budget. Yeah! The tile is a pretty addition to your bathroom and I like that you have also changed out fixtures to please you. Makes for a happy life. It’s a lovely bathroom, the mirror is great and what a steal to find it for $20! I have used peel and stick floor tiles – I once did a very large kitchen in a black and white checkerboard pattern. It was easy, just took my time to make sure all the tiles were lined up absolutely flush with each other before placing. Through a lot of foot traffic and many washings (I had 2 dogs then) for the 3 years I was in residence before I sold that house the tiles remained firmly stuck to the floor and remained shiny. They were impervious to the doggies’ nails, too. Finding the center of the room and then starting with tile placement from there was the most difficult part; this was pre-internet but I had two homeowner manuals that told me how to find the center – I used string. I didn’t remove the quarter-round, just cut the last row of tiles around the perimeter of the room with scissors to measure so each one butted up flush against the quarter-round. I would lay another vinyl tile or vinyl plank floor in a flash – the vinyl plank designs are so real looking now, highly water resistant and wear forever. The former owners of my current home installed it in the kitchen/dinette areas and it is very low maintenance and looks very nice. They installed a darker tone wood look plank, very sturdy and hard wearing. They had 2 kids plus a dog and installed the floor in 2012; I bought the home in 2014; the floor looks great. I did not find the instructions until I was done. But I started in the corner. Everything went well except at the end by the toilet, it is coming up a bit because I didn’t realize that the wall was not flush with the vanity. I am trying to figure out what to fix the wall with and then I may need to just replace that tile sheet. Any ideas? Do I use caulking to make the wall even? What an Absolutely Great idea!! It would be hard to not start the morning cheerfully with that bathroom. Another success story from you–keep ’em coming. Too, too cute! I absolutely love it! I love the red and white. I could stand and look at that room for quite a while. It is so cute. I have usded peel and stick floor tiles and they have held up extremely well. I want to add tile floors but simply because I need a change. And who knows I may just go with the plank peel and stick. Great job. It looks really nic. Fresh and clean. You can’t go wrong with red and white checks. Love that gorgeous bathroom !!! Red… my favorite “go to” color to use in decor… especially as an accent color!!! The pictures blend perfectly !!! Thank you for sharing …. Brenda, I love the look of your new peel and stick tile. I have been trying to figure out something to put behind my bathroom sink and I went over to Wayfair’s site and found some that I really, really like. And they are priced at a level I could actually afford! I am definitely going to get some. Do you think they could be used for a bath tub and shower surround? Maybe all that water would not be good for them, but I sure would like to upgrade the tile around my tub without the mess of actual tile and grout. I might be asking too much here! So, anyway, thanks for the info in this post! I can hardly wait to get some tile and get started! How pretty, Brenda! I love what you’ve done! You have really made your place HOME. How very charming!! Sometimes just the tiniest addition can add so much and your red backsplash does just that. Great idea. I was trying to find out some instructions for my bathroom finally i found your blog. It’s looks really pretty good top see your bathroom. It’s decoration is too attractive and choiceful. After read this article i feel that sometimes small addition can add so much. I am going to apply these ideas on my bathroom. Thanks for the sharing your valuable article.